I’m sitting by the fire. The house is quiet. All the boys just grabbed up lunches, backpacks, projects and reports and headed out the door. Sweet pastor-husband gave a peck on the cheek and a squeeze of the hand as he stepped out into the cold. I clean eggs out of bowls, gather piles of laundry and start up all the ‘machines’ (I’m so thankful for the machines!) I light the fire, collect my books, including the big one I love so much. 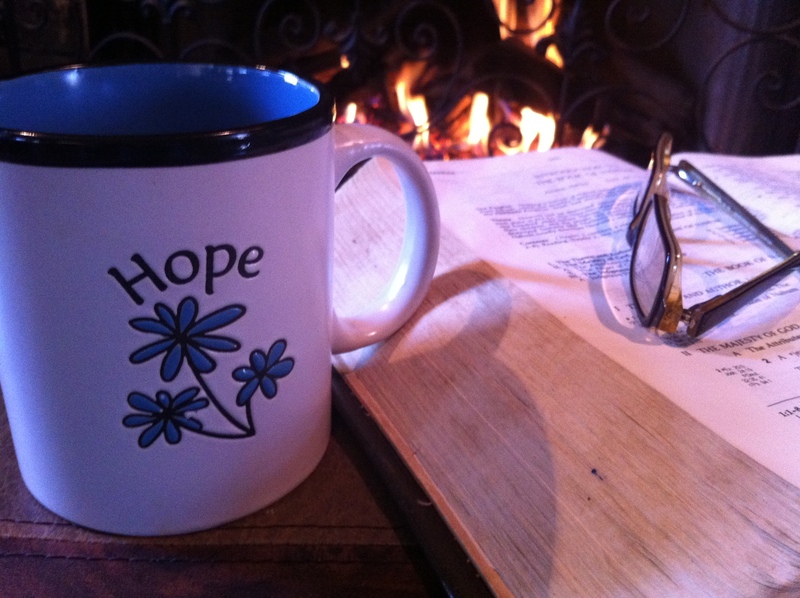 Just before I settle down to talk to God, I pour coffee into my “hope” mug, given me by a dear friend. I think about my day: the plumber coming, school supplies to purchase, the three things I forgot at the grocery store yesterday to be remembered today, bills to pay, dinner, and hope. “We are merely moving among shadows, and all our busy rushing ends in nothing. We heap up wealth, not knowing who will spend it. And, so Lord, where do I put my hope? My only hope is in you.” (Psalm 39:6-7, New Living Translation). I walk among the shadows and they clamor for my attention, my devotion, my hope. They promise happiness and joy…the shadows of wealth, pride, beauty, health, control, & pleasures promise and promise and promise. I’ve often believed them, striving, reaching, working to accomplish that which offers “the promised land,” only to find a shriveling soul and the echoing question, “Am I happy yet?” I long for the garden without the fall, and in the end, “hope deferred makes the heart sick.” (Prov. 13:12) The self-deception and the sick soul remind me that the True Hope is calling me. And the mystery comes alive. “Christ, in me…Christ in you, the hope of glory.” (Col. 1:27) As His kindness leads me to repentance, His presence brings me the fulness of joy I had turned from. His light casts out all the shadows. I’m filled with true pleasure, great excitement, thrilling anticipation as I wait to see just what He’ll do!